SCOTWISE: DAILY ENCOURAGEMENT TUESDAY - CLASSICAL TESTIMONIES… Florence Nightingale. DAILY ENCOURAGEMENT TUESDAY - CLASSICAL TESTIMONIES… Florence Nightingale. Florence Nightingale was born in Italy on 12 May 1820 and was named Florence after the city where she was born. Her parents, William Edward and Frances Nightingale were a wealthy couple, who had toured Europe for two years on their honeymoon. During their travels their first daughter, Parthenope, was born in Naples (Parthenope being the Greek name for the ancient city), followed one year later by Florence. On returning to England the Nightingales divided their time between two homes. In the summer months they lived at Lea Hurst in Derbyshire, moving to Embley in Hampshire for the winter. Lea Hurst is now a retirement home and Embley is now a school. Florence and Parthenope were taught at home by their Cambridge University educated father. Florence was an academic child, while her sister excelled at painting and needlework. Florence grew up to be a lively and attractive young woman, admired in the family's social circle and she was expected to make a good marriage, but Florence had other concerns. In 1837, whilst in the gardens at Embley, Florence had what she described as her 'calling'. Florence heard the voice of God calling her to do his work, but at this time she had no idea what that work would be. Florence developed an interest in the social questions of the day, made visits to the homes of the sick in the local villages and began to investigate hospitals and nursing. Her parents refused to allow her to become a nurse as in the mid-nineteenth century it was not considered a suitable profession for a well educated woman. While the family conflicts over Florence's future remained unresolved it was decided that Florence would tour Europe with some family friends, Charles and Selina Bracebridge. The three travelled to Italy, Egypt and Greece, returning in July 1850 through Germany where they visited Pastor Theodor Fliedner's hospital and school for deaconesses at Kaiserswerth, near Dusseldorf. The following year Florence Nightingale returned to Kaiserswerth and undertook three months nursing training, which enabled her to take a vacancy as Superintendent of the Establishment for Gentlewomen during illness at No. 1 Harley Street, London in 1853. In March 1854 Britain, France and Turkey declared war on Russia. The allies defeated the Russians at the battle of the Alma in September but reports in The Times criticised the British medical facilities for the wounded. In response, Sidney Herbert, the Minister at War, who knew Florence Nightingale socially and through her work at Harley Street, appointed her to oversee the introduction of female nurses into the military hospitals in Turkey. On 4 November 1854, Florence Nightingale arrived at the Barrack Hospital in Scutari, a suburb on the Asian side of Constantinople, with the party of 38 nurses. Initially the doctors did not want the nurses there and did not ask for their help, but within ten days fresh casualties arrived from the battle of Inkermann and the nurses were fully stretched. The 'Lady-in-Chief', as Florence was called, wrote home on behalf of the soldiers. She acted as a banker, sending the men's wages home to their families, and introduced reading rooms to the hospital. In return she gained the undying respect of the British soldiers. The introduction of female nurses to the military hospitals was an outstanding success, and to show the nation's gratitude for Florence Nightingale's hard work a public subscription was organised in November 1855. The money collected was to enable Florence Nightingale to continue her reform of nursing in the civil hospitals of Britain. When Florence Nightingale returned from the Crimean War in August 1856, four months after the peace treaty was signed, she hid herself away from the public's attention. In November 1856 Miss Nightingale took a hotel room in London which became the centre for the campaign for a Royal Commission to investigate the health of the British Army. When Sidney Herbert was appointed chairman, she continued as a driving force behind the scenes. For her contribution to Army statistics and comparative hospital statistics in 1860 Florence Nightingale became the first woman to be elected a fellow of the Statistical Society. In 1865 she settled at 10 South Street, Mayfair, in the West End of London and apart from occasional visits to Embley, Lea Hurst and to her sister at Claydon House she lived there until her death. Florence Nightingale's greatest achievement was to raise nursing to the level of a respectable profession for women. In 1860, with the public subscriptions of the Nightingale Fund, she established the Nightingale Training School for nurses at St Thomas' Hospital. Mrs Sarah Wardroper, Matron at St Thomas', became the head of the new school. The probationer nurses received a year's training which included some lectures but was mainly practical ward work under the supervision of the ward sister. "Miss Nightingale", as she was always called by the nurses, scrutinised the probationers' ward diaries and reports. From 1872 Florence Nightingale devoted closer attention to the organisation of the School and almost annually for the next thirty years she wrote an open letter to the nurses and probationers giving advice and encouragement. 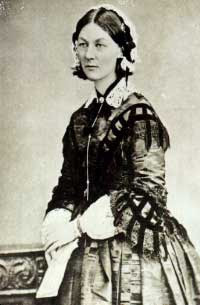 On completion of training Florence Nightingale gave the nurses books and invited them to tea. Once trained the nurses were sent to staff hospitals in Britain and abroad and to established nursing training schools on the Nightingale model. In 1860 her best known work, Notes on Nursing, was published. It laid down the principles of nursing: careful observation and sensitivity to the patient's needs. Notes on Nursing has been translated into eleven foreign languages and is still in print today. Florence Nightingale's writings on hospital planning and organization had a profound effect in England and across the world. Miss Nightingale was the principal advocate of the 'pavilion' plan for hospitals in Britain. Like her friend, the public health reformer Edwin Chadwick, Florence Nightingale believed that infection arose spontaneously in dirty and poorly ventilated places. This mistaken belief nevertheless led to improvements in hygiene and healthier living and working environments. Florence Nightingale also advised and supported William Rathbone in the development of district nursing in Liverpool and many Nightingale trained nurses became pioneers in this field. Although Florence Nightingale was bedridden for many years, she campaigned tirelessly to improve health standards, publishing 200 books, reports and pamphlets. In recognition of her hard work Queen Victoria awarded Miss Nightingale the Royal Red Cross in 1883. 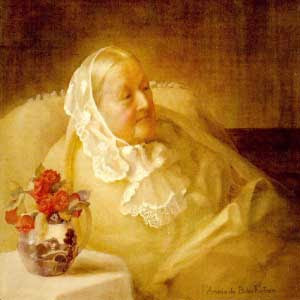 In her old age she received many honours, including the Order of Merit (1907), becoming the first woman to receive it. Florence Nightingale died at home at the age of 90 on 13 August 1910 and, according to her wishes, she was buried at St Margaret's, East Wellow, near her parent's home, Embley Park in Hampshire. Florence Nightingale's farsighted reforms have influenced the nature of modern health care and her writings continue to be a resource for nurses, health managers and planners. Loving Father, I thank you for the life and ministry of Florence Nightingale, a faithful servant, and one who knew you so well. By the power of the Holy Spirit, help me to be a person of like faith, that I may bring glory to your name. I ask this in the wonderful and mighty name of Jesus. Amen.